Tricoachflorida offers “realistically” priced coaching options for the everyday athlete on a budget. Affordable coaching in a fun and team based environment for those interested in both Multi-sport events, (swim,bike,run) and other endurance events. You don’t have to live in Florida to “Feel The Burn.” Our team is made up of athletes from all over the U.S. From 5k to Ironman, beginner to advanced, Tricoachflorida can get you across the line, no matter what the distance! Fred (“Cube”) Mehrer started his triathlon career in 2005 as a way to celebrate his 40th birthday. Although he could barely swim across the pool (25 yards) He thought it would be “fun” to give a sprint triathlon a try. Planning to do just one, he finished 3 sprint events that first year and was hooked. 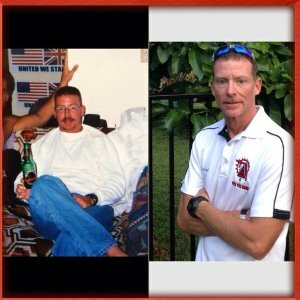 Nine years and Thirty-five pounds later, Fred has finished more then 70 triathlons of all distances. As a Flight Attendant, Husband and Step-father of two, Fred understands the challenges of juggling, travel, nutrition and family. He has trained everywhere from the beaches of Rio to the bullring of Madrid. If you have the will, he will help you find a way. Let him help you reach your dreams, from 5k to Ironman or anything in between. •6X USAT Age Group Olympic Distance National Qualifier. •Numerous Age Group and Masters Podiums. Success. Coach Fred Mehrer has been notified of your message.